We continue to experience some decent offshore fishing in Fort Lauderdale. The frontal system has now passed and the winds have swung around to the east as expected. Partly cloudy skies have replaced the cloudless days we had in the midst of the front but there is still plenty of sunshine and only a slight possibility of rain. Clear blue water almost to the beach and a slight south current now. Once again that south current is not our favorite but most days have yielded reasonable catches. 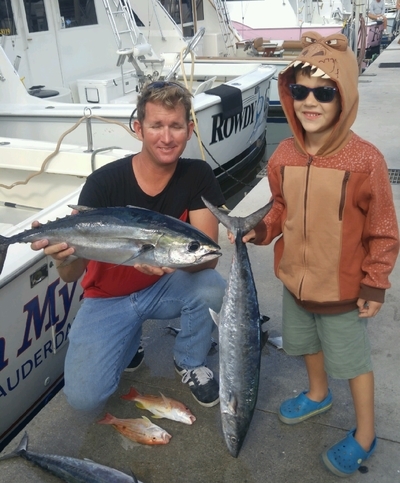 Despite the extremely clear water we are catching good numbers of Kingfish. While many continue to be school sized they are good fun and the action they have been providing is welcome. 80 to 110 feet of water depth has been best and they have been right out front of our inlet. Wee have been trolling extremely slow with light gear to draw the bites in this clear water. Kingfish have notorious eyesight and can be tough when the water is this pretty, but we are getting the bites most days. Some Blackfin Tuna and Skipjack Tuna out in 250 to 400 feet and an occasional Sailfish there also. Seeing some Sails inside in water around 120 feet too but overall the sailfish bite has slowed considerably the past couple of days. Good Wahoo around and we are spending some time with the live ?Bullett Bonito? as bait as this is a good time of year for them. Some big Barracudas around as well and they are scattered in all depths. They are now strictly managed by the State and just added to the management this week. We have always released close to 100 percent of them as it is not wise to eat them, but many anglers from the north enjoy experiencing a big Cuda on the line. As for our mainly anglers from the south the Mahi-Mahi remain once again scarce. Always a south Florida favorite fish, good to eat and actively managed for years now, they remain a chance encounter this week. Happy Thanksgiving from all of us (Rick, Matt, Tommy, Garrett and JJ) aboard the Marlin My Darlin. Tight lines and good fishing.